Are you planning on bottling and labeling any wines with the name of a Monterey County AVA in the new year? Then you’ll need to comply with a new conjunctive labeling requirement. See Cal. Business and Professions Code Sec. 25247. In 2015, the state legislature passed a law requiring wine labeled with the name of an AVA that is entirely within Monterey County to also include a “Monterey County” designation. This includes the Arroyo Seco, Carmel Valley, and Santa Lucia Highlands AVAs. The law applies to wines bottled on or after January 1, 2019. The law does not apply to AVAs that straddle Monterey County and any other county. For example, the Chalone AVA bridges Monterey County and Benito County, so a wine labeled with the Chalone AVA is not covered by Sec. 25247. There is one other exception to the conjunctive labeling requirement: wines labeled with the Monterey AVA. This is where things get a little confusing. Under federal law, a wine can carry the name of a county as an appellation of wine origin. AVAs are also considered appellations, but in order to carry the name of an AVA, a higher percentage of the grapes must come from that AVA. In both cases, the wine must be fully finished in the state in which the county or AVA is located (assuming the AVA is entirely within one state). Federal regulations recognize both a “Monterey County” appellation, as well as a Monterey AVA. 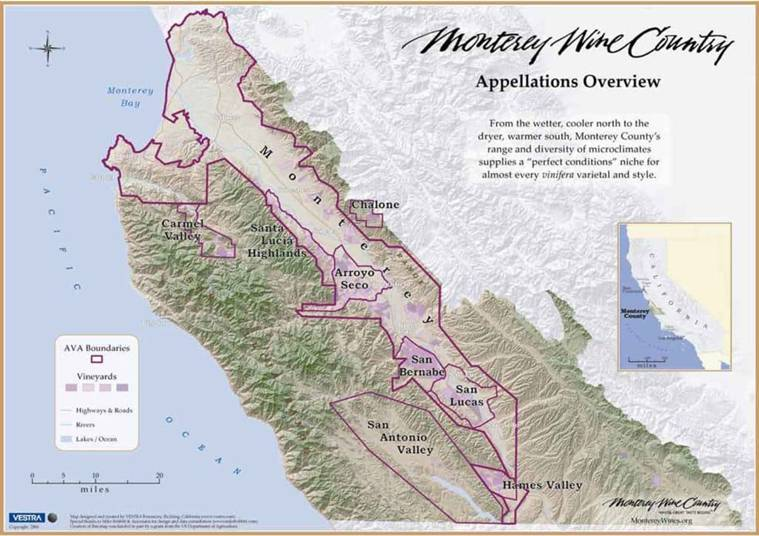 The Monterey AVA is located in Monterey County, but does not cover all of Monterey County (see map below). Any wine that is labeled with the Monterey AVA is exempt from the California conjunctive labeling requirement found in Cal. Business and Professions Code Sec. 25247. For more information regarding conjunctive labeling or wine labeling regulations, please contact John Trinidad.